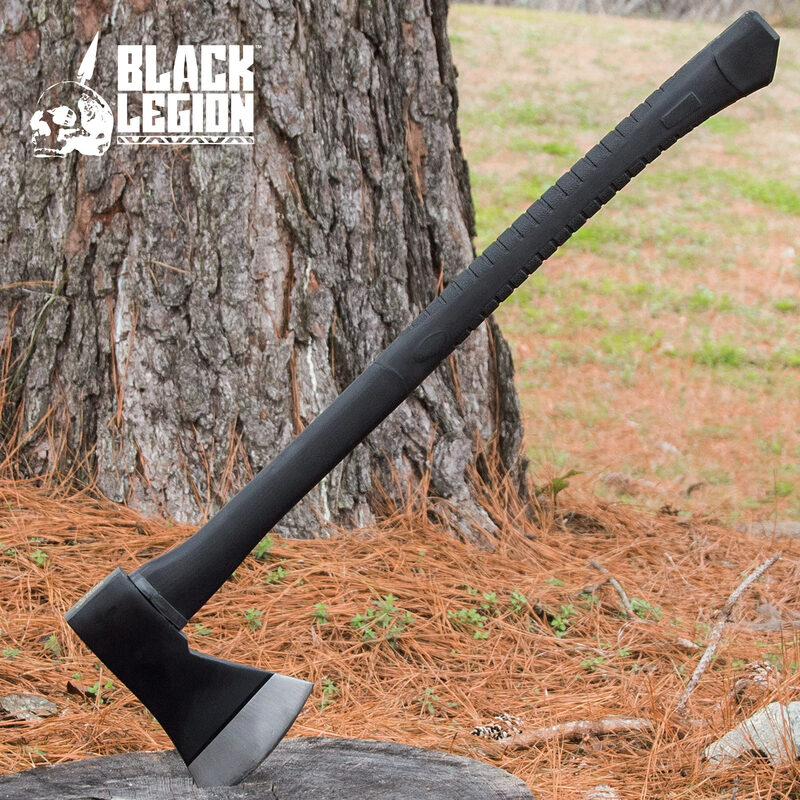 This all black Firefighter Axe is rugged, solid, and can be used for just about any tough job you can think of. Featuring a high-grade tool steel head that is firmly mounted to the fiberglass handle, this is a durable tool that can deliver devastating blows. The virtually unbreakable fiberglass handle is rubberized for a no-slip grip. 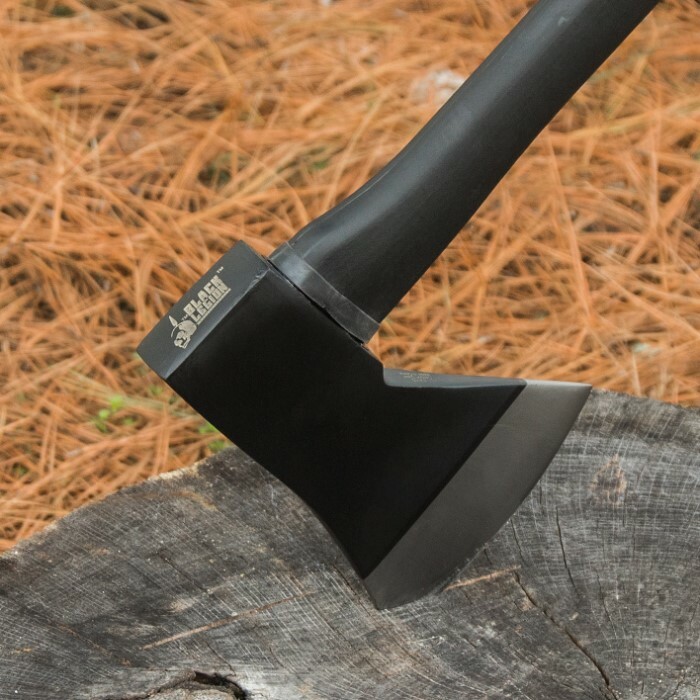 This fire axe makes short work of cutting and demolition projects. 5 in. blade, 8 in. head, 28 in. overall. I ordered this back when it was a BOGO, and they sat in the garage for emergency purposes. I recently put one to use cutting up a recently fallen oak tree, trimming off branches when the handle snapped in two. The rubber coating on the handle prevented any injury from taking place, but this was unexpected. To make lemonade out of this lemon, we heat treated the broken fiberglass and re-wrapped the handle to make it a large hatchet. All told, I wouldn't buy another one. If I had stuck with my intended purpose, it probably would have been fine. JUST CAME IN THIS MORNING . SWEET . LOVE THIS ONE . I got a couple of these one for the camp box and one for the garage. Really liked the first one I opened worked hard in the yard all day and it stayed with me. The one in the camp box... didn't have the same finish,or feel, almost like it was made by a different company. Nice axe but where was the quality control before delivery? Received axe and it looks like someone smacked it on the edge of a metal table or something. The edge was dull, wouldn't even say sharp let alone Razor Sharp but again that's typical of an axe so no biggie there, but there was a dent on the blade about the width of a pinky finger! Even the little rubber cover was cut through at that spot. Since the blade needs sharpening anyway the damage will be fixed when I sharpen it so point in sending back but I am a bit disappointed with Black Legion as the axe should have been packed in more than just a plastic bag from the manufacturer which might have kept it from being damaged. Everything thing else in my order was perfect and you can't BudK's prices. I bought this for ten dollars and it is an amazing axe. It is a true axe, so don't think it will come with a sharp edge. I do wish it came with a sheathe, but I love the use for it. I purchased this Axe on sale for $10 with free shipping and I have to say that I got one heck of a deal! I regret not buying more, at that price, while I had the chance. The reason I only purchased one axe is because I wasn't sure about the quality of the axe itself but after receiving it and putting it to use, this axe is definitely one to keep handy! Overall, it truly is a great axe. Especially if you get one on sale. It came with a decent edge for an axe but I did touch it up a little for personal preference. The rubberized grip definitely helps but I would recommend wearing gloves for any extended period of use. It is a long axe but it's not too big or heavy. 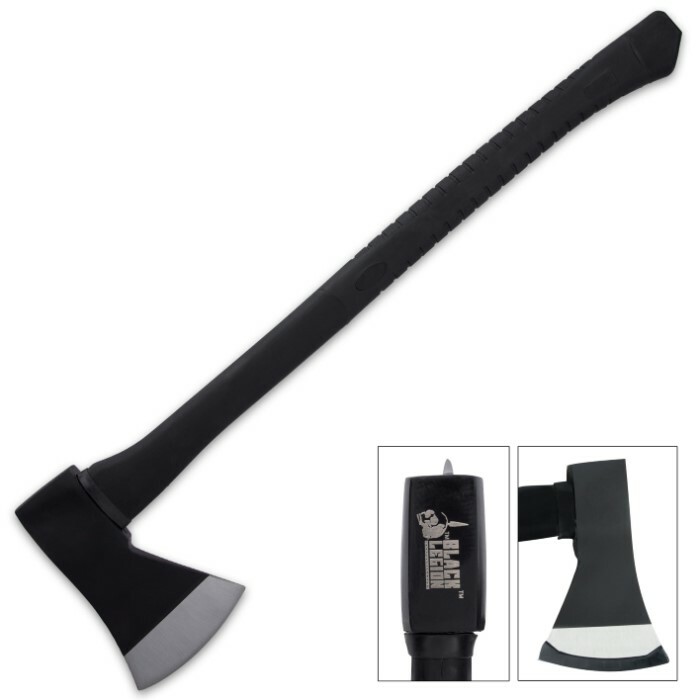 It's great for camping or any outdoor activities that would require any use of an axe. This axe is awesome. I'm not sure if I should cut wood with it or just hang it on the wall, it's beautiful.